I went with one of Donald G. Hunt's tour groups to Palestine and Turkey. We stopped in New York, Amsterdam, Tel Aviv, toured Israel, visited Masada, Athens, the locations of the Seven Churches of Revelation and Rome. It was a good travel value and the information and experience was of tremendous worth to me as a Bible teacher. Ron Hunt was my sidekick on this trip. I did the sound recording and he took the photographs. On this trip, I got the feeling of culture shock for a few moments. Our group was doing a walking tour of Izmir (Smyrna) in Turkey. It is a city of 2,000,000 people. The alphabet is Cyrillic so words do not even have a familiar portion. We were told that it was important to stay with the group. We visited a bookstore and I found something that captured my interest. When I looked up, the group had gone. But which way? I soon located my friends and paid closer attention after that. But oh, that feeling of being lost without a solution. in the the Duwamish River. One memorable, but short, trip was with Dave Nelson in Seattle. He asked Lois and me to join him in a ride in his Amphicar convertible. Joy was with us, too. It was late at night and we drove to the Duwamish River, down the boat ramp, shifted gears and out into the river. 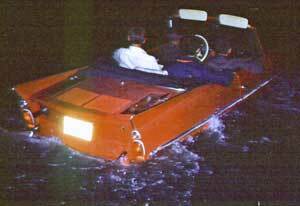 The Amphicars were designed to drive in the water. They have twin propellers in back that takes the engine power after a gear is shifted. Lois and I both had the feeling of being at the wrong place at the wrong time. Dave, making jest, called to the crew of a large ship that was docked nearby and said that we had fallen from the bridge and ask how to get back again. In 1994 Lois and I traveled to Zimbabwe where I taught at Zimbabwe Christian College for a quarter. The school is located in the capital city of Harare, a city of 1.6 million people. Classes included the Life of Christ and Church Growth. I pioneered email for the Christian community. It was available only with difficulty then. Now it is in common use by nearly all of the missionaries. We had an apartment on campus and drove a very yellow Volkswagen Passant to get around town. Driving required Lois navigate, especially at the intersections, so I would end my turn in the proper place. They drive on the opposite side of the street and the steering wheel is on the opposite side from our cars. This is a bit confusing for a person in their sixties. We both traveled on weekends to important church locations within the country, sometimes by plane. I preached one Sunday morning to a combined meeting of all of the Churches of Christ in Bulawayo. A highlight of my time in Harare was lunch with a fellow-believer in the Zimbabwe government. Dr. Christopher Chetsanga had spent some time at the Church of Christ at Hood River, Oregon. He had been at the University of Zimbabwe, but was now in charge of the Scientific and Industrial Research and Development Centre for the government. He reported directly to the president of the nation, making his job like a cabinet secretary in this country. Following a marvelous lunch in a world-class hotel restaurant, we explored ways to help lift Zimbabwe out of its backward economic condition. One of their few assets is farming. Current government policies are destroying the farm output, but this was not true yet when we were talking. In our excursion to Africa, we stopped a few days in London to break the trip, enjoying the sights and sites of this ancient city. On our return trip, we made the same kind of layover. The outstanding London moment for me was seeing the Codex Sinaiticus and the Codex Alexandrinus at the British Museum. The museum staff did not focus attention on them, but their presence made be deeply appreciative of what God has done to preserve his message through the centuries. We may return to London to experience some more of its grandeur another day.